When you enter the lobby at the a-ja resort in Saarow, you are surrounded by a meadow full of flowers and the sound of birds chirping. ‘We wanted our guests to experience that holiday feeling and enjoy their quality time with us from the very first moment,’ says resort manager Andreas Winkler. The brand attaches great importance to unique interior designs that transform spaces into a vivid experience for all the senses. In order to make this a reality for a-ja, the company needed a material that could keep up with the diversity of the rooms in the resorts. Ultimately, the team decided that Sihl’s DESIGN2WALL wallpapers were really the sensible option for the project. 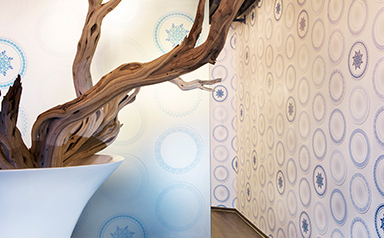 The main feature that makes the quality of these wallpapers stand out is the coating applied to the base material. It paves the way for modern digital printing techniques that open up virtually unlimited possibilities for wallpaper design while at the same time considerably lowering costs. How can rooms make an overall impression? The holiday experience begins in the reception area – but it goes much further than that. The use of decorative elements such as lamps, tables and chairs gives the rooms a truly distinctive character. But it is the wallpapers that complete the whole effect. Andreas Winkler explains his approach: ‘Regardless of whether the guests are sitting down or passing through the building, each room should really appeal to their senses.’ For instance, our guests can dine under real trees in the ‘nature’ area or sit in the family area under Lego bricks. Baroque embellishments exude tranquillity and relaxation in the quiet spa room. And in the corridor on the way to the restaurant, retro-style pictures of dishes stir up an anticipation of delicious, inviting food. ‘Each image has been carefully selected and perfectly matches the other elements in the room. The outcome is an artistic entity that creates a unique atmosphere and a completely unique experience’, says Andreas Winkler, describing the concept. Why was Design2Wall the best option for a-ja? The quality to produce precise, razor-sharp images with a wide colour gamut and excellent colour rendering. The project team decided on the SIHL Non-woven design2wall Sol 195 satin (2511) wallpaper to ensure a-ja could benefit from all these properties. The interior design concept in Bad Saarow was implemented consistently throughout all areas on a truly large scale. A total of over 4,500 square metres of wallpaper was printed with motifs, approximately 3,500 square metres of which was hung in the 150 hotel rooms and around 1,000 square metres appears in public areas of the resort.